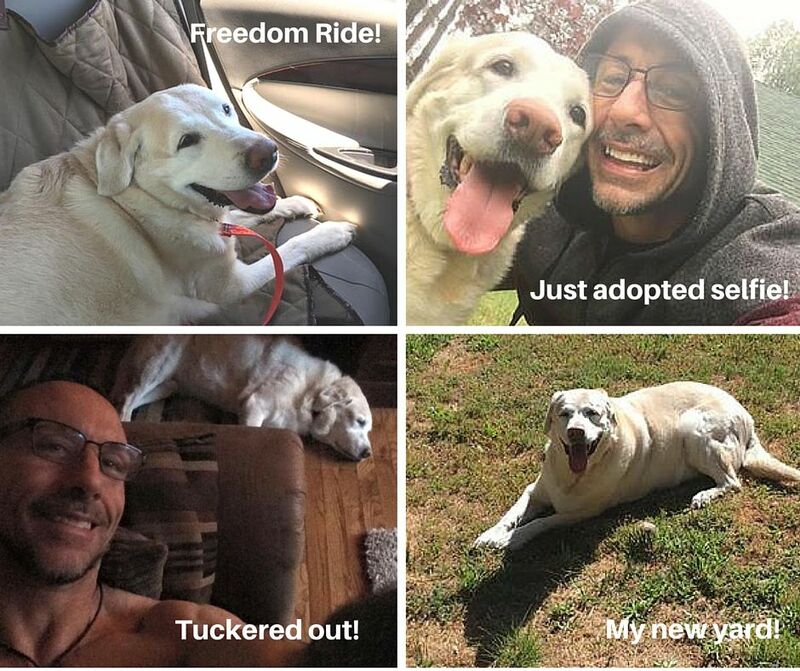 Senior Dog Thorton Gets Best Day Ever! Senior dogs and cats enter our shelter on a regular basis for various reasons, perhaps their human passed away and there is no one to care for them anymore. Or perhaps they have a health issue that their owner cannot support, and despite our offer of assistance, their guardian surrenders them to our shelter. What ever the reason may be we are happy to be able to provide a safe haven for the frosty faces who need us, and do our best to get senior dogs and cats out of our shelter and into loving homes for their golden years. "I was invited to attend a Saturday afternoon graduation party by my friend, Tricia, at Coachella Valley Brewing Company in Thousand Palms. Tricia said 'CVB is very dog-friendly, so bring one of your dogs.' 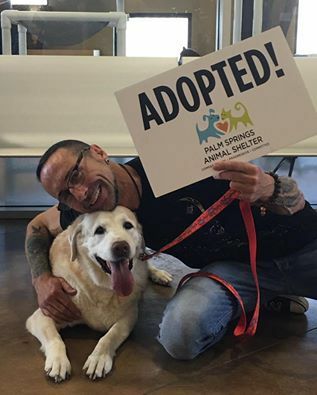 Instead, I decided to take eleven year old yellow lab Thorton whom I had not been able to get off my mind after seeing him at the shelter earlier in the week. Thorton was thrilled to be going for a ride and was even more thrilled to greet Tricia and her friends and family at the brewery. He was the perfect party guest, turning on the charm with everyone he met. On my way back to the shelter, I decided that although it was late afternoon, the day was still young (and so were we!) and that Thorton was having such a good time being out and about town that I would take him to the dog-friendly Kaiser Grill patio. There, general manager Jerry Mendivil became immediately smitten. I took a few photos of Jerry with Thorton, which Jerry quickly posted to his Facebook page. Jerry's good friend Andrew who had recently lost his beloved senior dog to megaesophagus, responded to the post right away, saying he wanted to meet Thorton. Andrew missed his beloved Bella but had room in his heart and home for another dog and wanted to honor Bella by rescuing a senior dog. Andrew drove down from Idyllwild on Wednesday to meet Thorton at the shelter. It was a perfect match from the start. Thorton ran to Andrew right away as though he had been waiting for him, as if he knew that this is the guy who is going to love him for the rest of his life. And he was right." Andrew told us, "I lost my Bella on 4/30/16 from Megaesophogus, an enlargement of the esophagus that impairs the ability to move food down to the stomach. She was just 6 years old. I truly believe that it was Bella who delivered me to Thornton. I was supposed to be in Virginia from 4/18-4/25 but some unforeseen circumstances, including my broken heart, caused me to postpone that trip, and I spotted Thorton on Facebook. It's my honor to dedicate myself to the care of Thornton in her memory. I know that she is wagging her tail, smiling, and barking her happy bark from across The Rainbow Bridge." We do a lot to find homes for every pet in our care, but sometimes, it's the little things that get them noticed. A doggie's day out can change everything and you can help by becoming a volunteer. Join our dog team, and help us find forever homes! Dog walking, play groups, mobile adoption events or just giving a dog a break from the shelter could change everything. Join our life saving team at Palm Springs Animal Shelter, attend our next volunteer orientation! Click here for our calendar of events.